When Simon Peter realized what had happened, he fell to his knees before Jesus and said, "Oh, Lord, please leave me — I'm such a sinful man." For he was awestruck by the number of fish they had caught, as were the others with him. His partners, James and John, the sons of Zebedee, were also amazed. Jesus replied to Simon, "Don't be afraid! From now on you'll be fishing for people!" And as soon as they landed, they left everything and followed Jesus. A humble servant is essential to prepare the way for the Messiah's work. 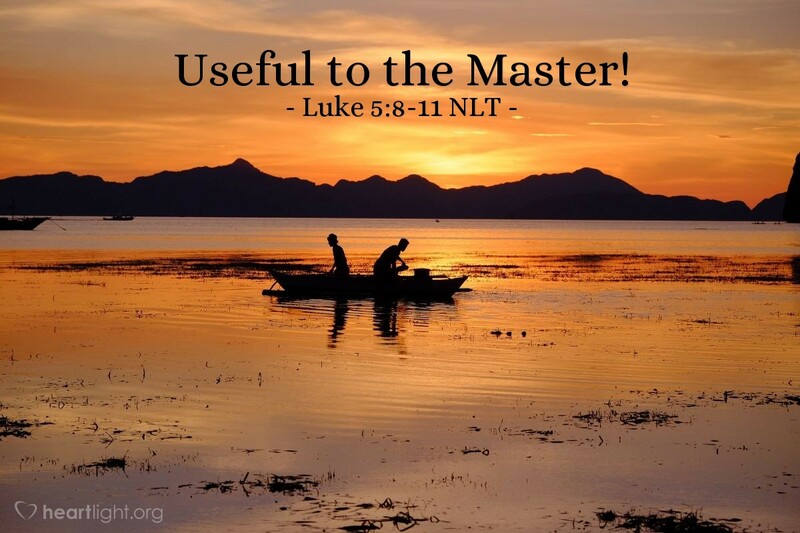 We saw that principle clearly demonstrated in the life of John the Baptist (Luke 3:15-16). A humble heart is essential for people to receive Jesus as both Lord and Messiah. In today's verses, we see humility demonstrated from an unlikely source, Simon Peter. Peter recognized that he was in the presence of greatness when he was in the presence of Jesus. Compared to Jesus, Peter knew he didn't come close to measuring up even on his best day. He was a sinner. He was limited. He experienced failures. He kept having his closed mind blown open by something done by someone far greater. To his credit, Peter was honest with himself when comparing himself to Jesus. Throughout his long ministry, Peter would have to learn the lesson time and time again; he was most valuable to the Master when he served out of genuine humility. Father, humble me gently and help me correctly evaluate myself in light of Jesus' glory, grace, and character. I am a sinner. I am thankful, dear Father, that you have saved this sinner by your grace and have given me a place to serve you. Please forgive, repair, and equip me for your service. In Jesus' name, I pray. Amen.